There are many different services offered in the landscape and horticultural industry, including the architectural designing of the landscape. Landscaping work can involve preparing the soil and grading, installation services for irrigation, planting, and construction services, such as building and repairing retaining walls, laying pathways, and building patios. And let's forget arborist services like clearing growth from overhead lines and tree trimming. Each of these tasks poses its own potential risks and dangers that demand specific safety measures. Horticultural and landscaping services can be divided into two main categories: maintenance tasks and construction tasks. While both pose potential danger, the additional tools and equipment involved in the construction side of landscaping and horticulture create some serious safety concerns. Each aspect of the industry is regulated by OSHA standards: OSHA Standard Citations (29 CFR 1910) and Construction Industry Standards (29 CFR 1926). Creating a safe working environment begins by ensuring a clean work area. This means making sure that no scrap lumber is lying around, especially any with nails sticking out. Anything combustible that is considered scrap material should be safely removed at regular intervals. Plan ahead and ensure that there are enough containers on hand to sort the various types of debris for removal from the worksite. It is up to the employer to make sure that a proper and up to date first aid kit is kept stocked and that its location is known by all workers at all times. Make sure that at least one worker who is formally trained in first aid is present in the case of an emergency. The first aid kit should be a weather proof container and its contents comprised of individually sealed packages (find out what it should contain in First Aid Kits: The Essential List). Most commercial landscaping and horticultural work is done outdoors and often in hot weather. Dehydration can set in quickly in workers spending all day outdoors. It is important to have a good portable water supply on hand during the entire working hours. The water container should be tightly closed and equipped with a tap—no dipping containers should be used. Adequate head protection is essential if there are any activities or conditions on the worksite that involve heavy objects falling, such as branches falling during tree trimming. If work is taking place near power wires, a class A helmet will help protect against electrical shock from low voltage conductors. This industry involves the use of various power tools. Workers, then, have to be protected against the high noise levels they are exposed to on the job. Ensure that all employees have hearing protection that provides sufficient protection for the decibel levels in their work environment. In this industry, being struck in the face (by tree branches, for example) is always a real possibility. Proper eye and face protection, then, is essential. Impact resistant goggles, for instance, may be required to protect against flying wood chips. Given the risks of working with heavy objects, steel tools, and in an environment that may be littered with sharp objects, every employee should wear steel toed boots with good soles. Safety gloves provide protection against cuts and pinches, but PVA gloves might be a better choice for workers whose job tasks might involve exposure to toxic foliage or chemicals. If pesticides are being used, workers need to wear a half face respirator with the appropriate cartridges as dictated by the MSDS sheets. It is up to the employer to ensure that all electrical equipment is in proper working order and safe for use. Particular care should be given to understanding how to safely use the equipment in outdoor environments. For bigger jobs, heavy equipment is often left at the jobsite overnight. Ensure that it is left in a safe location and properly locked. The wheels should be blocked to prevent roll-away incidents (for more advice, see Top 10 Safety Tips for Heavy Equipment Operators). Some tree trimming jobs require working near high voltage wires and power sources. Only assign workers to these tasks if they have been properly trained for this type of work. If necessary, utility companies may need to be contacted to disrupt the power source and ensure the safety of the tree trimmers. In the landscaping and horticultural business, working at heights is fairly typical. 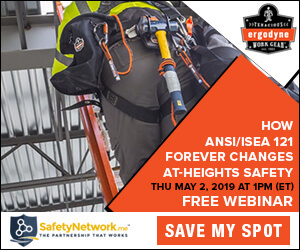 Whether this involves using a ladder, a cherrypicker, or fall protection equipment, take additional care to follow all regulations and safety guidelines for the equipment and do not exceed its load bearing capacities. It is the employer's responsibility to ensure that everyone using this equipment is trained to do so safely. Like any other industry, landscaping and horticulture has its fair share of hazards. These need to be understood and controlled. Ensuring that the various job tasks are undertaken in a safe manner should be every employer or manager's highest priority.